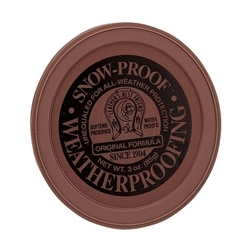 By The Sword, Inc. - Snow Proof Waterproofing, 3 oz. Home → Medieval and Renaissance Accessories → Medieval Reenactment Accessories → Snow Proof Waterproofing, 3 oz. This colorless and odorless formula helps prevent mildew, dry rot, salt stains and scuff marks while preserving, waterproofing, restoring and softening leather. Great for boots and shoes. Product may darken light leathers and is not recommended for suede.